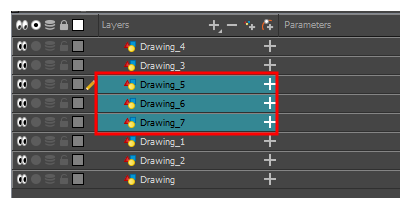 You can perform five types of locking actions on your layers. You will still be able to modify locked layers in the Timeline and Layer Properties views, but you will not be able to select them through the Camera view. From the top menu, select Animation > Lock > Lock. Click one of the selected layer’s Lock icon. Press Ctrl + Alt + L (Windows/Linux) or ⌘ + Alt + L (macOS). From the top menu, select Animation > Lock > Unlock. Click a selected layer’s Lock icon. Press Ctrl + Shift + K (Windows/Linux) or ⌘ + Shift + K (macOS). From the top menu, select Animation > Lock > Lock All. 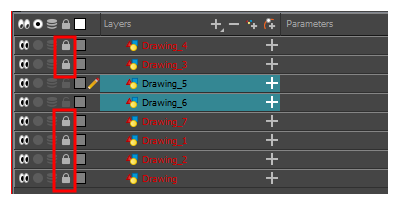 In the Timeline view, select all layers and click Lock icon of a selected layer. Press Ctrl + Shift + L (Windows/Linux) or ⌘ + Shift + L (macOS). From the top menu, select Animation > Lock > Unlock All. 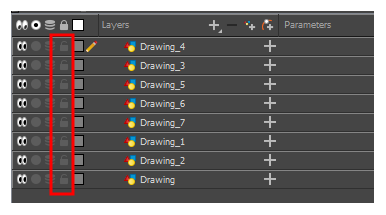 In the Timeline view, select all layers (locked) and click Lock icon of a selected layer. Press Ctrl + Alt + Shift + L (Windows/Linux) or ⌘ + Alt + Shift + L (macOS). From the top menu, select Animation > Lock > Lock All Others. Press Ctrl + Alt + Shift + O (Windows/Linux) or ⌘ + Alt + Shift + O (macOS). In the Camera View bottom toolbar, enabled the Outline Locked Drawings option. You can also set this option as a permanent preference. From the top menu, select Edit > Preferences (Windows/Linux) or Harmony Advanced > Preferences (macOS). 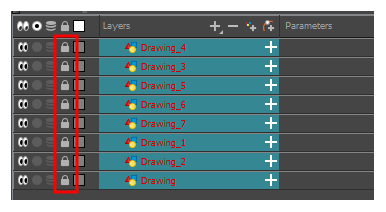 In the Tools section, select the Show Locked Drawings As Outlines option.